Can’t decide between sweet and savory? 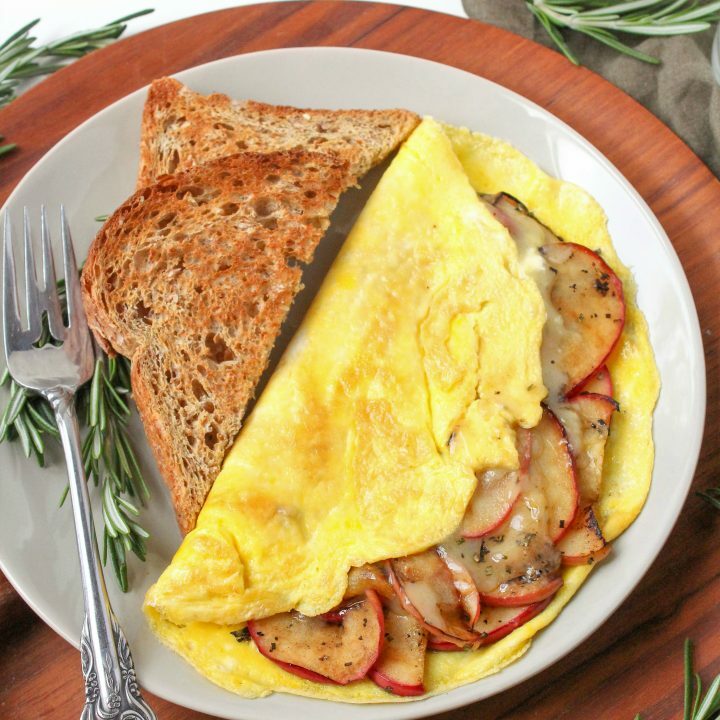 Have both with this apple and white cheddar omelet, which makes an especially great post-workout refuel! Thank you to the Egg Nutrition Center for sponsoring this post. I work with a lot of runners through my AnnetheRD private practice, and a common mistake that I see is them either not refueling quickly enough after a workout, or not taking in the right balance of nutrition after a workout. I suggest making sure to eat within 30 to 45 minutes of a workout, because in my experience (with myself and my nutrition clients) waiting any longer can lead to getting too hungry and overeating when you do eat, or can contribute to sugar cravings later in the day! Aim for a mix of carbs AND protein after a workout. The carbohydrates help replenish glycogen stores, while the protein aids in building and repairing muscle. Since I run in the morning, eggs are my absolute favorite way to get my post-workout protein – one large egg has 6g of high-quality protein. Dietary protein quality is determined by how well the body absorbs and utilizes the protein, and whether it contains all essential amino acids. Eggs, like milk and beef proteins, are high quality protein sources, which is good news for my post-run brunch habit! Fun fact: did you know that over 40% of the protein in an egg is actually in the yolk? That’s where you’ll find the egg’s fat soluble vitamins, too, like vitamin D, which is critical for bone health and immune function. I eat eggs nearly every day of the week, and omelets are one of my favorite ways to enjoy them, especially on the weekends. For fall, I thought I’d jazz things up with an apple and cheddar variation, which is one of my favorite sweet and savory combos! This recipe is simple as can be. Just sauté the apples in a pan with a little rosemary until soft, then remove the apples and pour in the eggs. 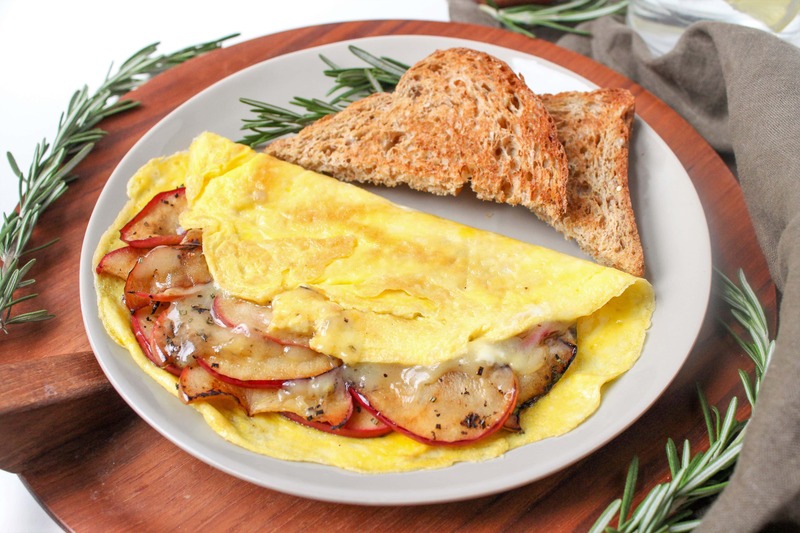 When the eggs have just started to set, toss in the cooked apples and shredded cheddar cheese. When the cheese is melted and the eggs are fully cooked, you are ready to rock! Serve with some bread and/or fruit on the side to get in your recovery carbs, and enjoy! 1. Heat a nonstick pan over medium-high heat and spray with cooking spray. Add apple slices, rosemary, and a pinch of salt and pepper. 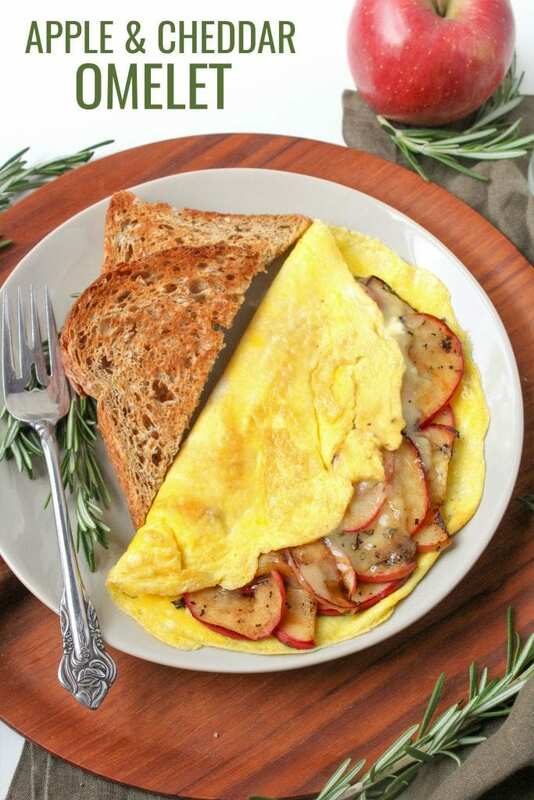 Cook for 4-5 minutes, until apples are browned and tender. Remove apples from pan and set aside. 2. Add eggs to pan and tilt to coat the bottom of the pan. Cook for 2-3 minutes, until eggs are starting to set. 3. 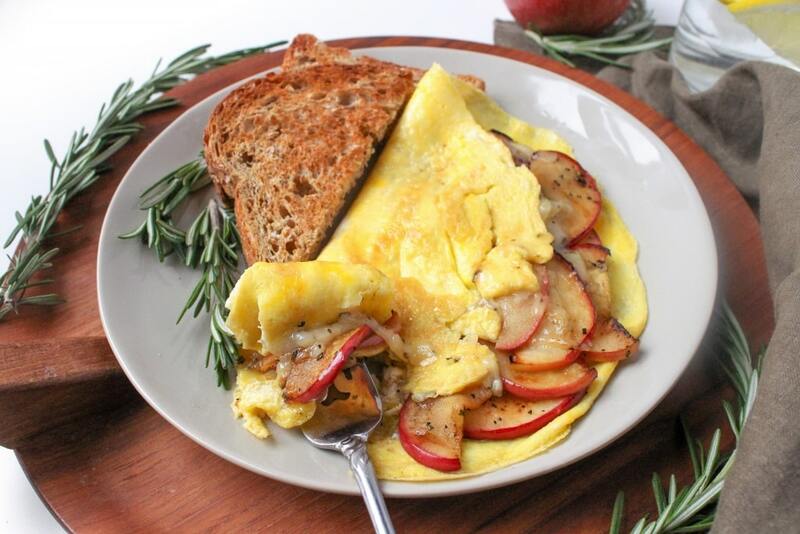 Top with apples and cheddar cheese. Continue cooking until cheese is melted and the eggs are fully set. Fold in half and serve with whole grain toast. Want more delicious egg-inspired refuel recipes/ideas? Here are some faves of mine. What’s your favorite way to refuel with eggs? this looks delicious! i love the savory/sweet combi! I am going to try this over leftover Thanksgiving cornbread dressing heated in the waffle maker! 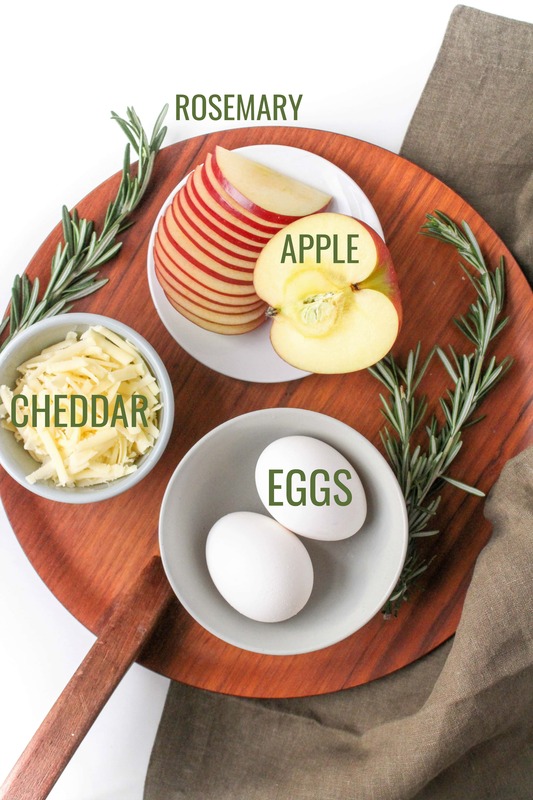 I will cook the apples and rosemary then layer those on top follow by cheese and an over easy egg. :) Thank you so much for this idea, Anne! Yum that sounds delicious – let me know how it turns out! I’ve made apple and white cheddar omelets together before…such a yummy combination! I’ll have to try the fresh rosemary next time too. I made this for my husband and he loved it! He said he’d order it in a restaurant and be really happy. I served it with some habenero chicken sausages and hashbrowns for him. Thanks for the great idea! Aw, I’m so glad it was a hit! :) Delicious side choices, too! I would’ve never thought to use apples in an omelet before! I’m really curious to see how this tastes! Luckily I woke up early today so i have enough time to this for breakfast! What a great recipe! Thanks, Anne!